Haq's Musings: Mina Stampede: Can Recurring Hajj Tragedies Be Prevented? Mina Stampede: Can Recurring Hajj Tragedies Be Prevented? My friend Khan is in Makkah for Hajj yet again. He says he was in Mina for Ramy al-Jamarat (Ritual Stoning of the Devil) when a tragic stampede claimed nearly a thousand lives this year. Besides those killed, more than 800 were reported injured. It was the deadliest day for the Hajj since more than 1,400 pilgrims suffocated in a crowded tunnel near Mecca in 1990, also on the day of the stoning of the devil ritual, according to a National Geographic report. Even though Hajj is required only once in a lifetime, my pious friend Khan has far exceeded this requirement. He has been to Mecca for the annual pilgrimage every year for more than a decade. He proudly announces his presence in Mecca and posts his Hajj pictures on Facebook as his Hajj count rises every year. As the world's Muslim population has grown to nearly 2 billion people and the faithful enjoy rising incomes and easy access to air travel, there has been a tremendous increase in the number of people performing Hajj. The rituals associated with it require the presence of all of the pilgrims in a relatively small space within a short period of time. This requirement puts tremendous pressure on the Saudi government to ensure flawless movement of millions of pilgrims. There is very little margin for error. Even small errors of the administrators or poor judgment of only a few of the millions of pilgrims in this monumental exercise get amplified leading to major loss of life. This has become almost a regular feature of Hajj with tragic deaths. The obvious include adding more capacity to handle more pilgrims and/or limiting the number of people permitted to perform Hajj each year. The Saudi government has been spending tens of billions of dollars to increase capacity at the Grand Mosque in Makkah, the tent city in Mina and the Jamarat where the stampede occurred as pilgrims prepared to throw pebbles at three pillars representing big, medium and small Satan. More levels have been added around the Grand Mosque for tawaf (circling around the Kaba). The height of the Jamarat has been increased and a multi-level structure built to accommodate more people simultaneously. A large number of cranes visible in Makkah confirm the continuing massive construction projects undertaken by the Saudi government. In fact, the earlier deaths in the Grand Mosque occurred when one of the construction cranes crashed down on the people performing Tawaf around the Kaba. Since Hajj is required to be performed only once in a lifetime, it makes sense for the Saudi government to limit how often visas/permissions are granted to people to perform Hajj. In my view, the Saudis should impose once in five years restriction on issuance of Hajj visas. In addition, the Saudis should enlist the help of religious leaders to persuade pilgrims to stagger the pebble-throwing ritual. Many pilgrims, particularly those from South Asia region, believe that they must follow the Sunnah of Prophet Muhammad (PBUH) by doing Jamarat (pebble throwing) at zawal time, the time between Zuhr (high noon) and Asr (mid-afternoon). This limits the amount of time for this ritual to just a few hours. The religious leaders should issue fatwas (edicts) making it permissible to do Jamarat any time from sunrise to sunset. This will reduce the number of people present near the Jamarat and reduce the chances of tragic stampedes. Specific circumstances for each tragic incident at Hajj may vary but the underlying cause remains the same: Capacity overload with too many people in a single space at one time. There'll be more such incidents unless this underlying cause is addressed. In more developed nations of the West, maximum capacities are posted for all venues. These are strictly enforced for safety reasons. The closest thing to Hajj crowds in California is Disneyland with maximum capacity of 65,000 people. When more than 65,000 people showed up for Disneyland's Diamond Jubilee celebration earlier this year, Disney management closed the park. When Eid crowd exceeded capacity at Santa Clara Convention Center last year, the city Fire Department ordered everyone out to enforce the fire code. Urgent actions are needed to prevent more and bigger Hajj tragedies with increasing Muslim population and greater demand for Hajj. Increasing capacity alone will not work; the Saudis must also limit the number of people permittec to perform Hajj each year. These actions will make Hajj safe for all in future years. Is Ramadan an Excuse to not Work? I read your articles with admiration and high values. However, I am sorry to say that your recent article about the Hajj Stampede was very disappointing. It looks like an official statement from a Saudi Official. Please have your friend write one about his eye witness accounts. Taj S: " It looks like an official statement from a Saudi Official. Please have your friend write one about his eye witness accounts." Specific circumstances for each tragic incident at Hajj may vary but the underlying cause remains the same: Overloading with too many people in a single space at one time. There'll be more such incidents unless this underlying cause is addressed. In more developed nations of the West, they post capacities for all venues which are strictly enforced for safety reasons. The closest thing to Hajj crowds in the United States is Disneyland with maximum capacity is 65,000 people. When more than 65,000 people showed up for Disneyland's Diamond Jubilee celebration this year, the management closed the park. When Eid crowd exceeded capacity at Santa Clara Convention Center last year, the city Fire Department ordered everyone out. Simple solution - shut down the Hajj facility, or transfer Ka'aba to somewhere in Europe or Israel. 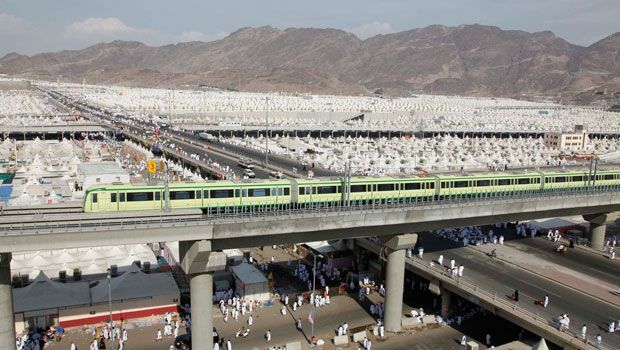 2- Train each intending Haji on the total process outside of Mecca, take an SAT like written test, and then allow only qualifying person to come for Hajj. One of my office mate in Riyadh is performing every week Umra and visit to Madina for last thirty years.I think he has made a world record for performing Umra and visit to Madina continuously for thirty years. I agree with you especially #2. People who do multiple Hajj are not doing any good for them or other. They may be contributing to problems like this and other. Many other solutions I have read/heard are impractical. Without commenting on the intentions of any one since only Allah knows the intention, I can say that Hajj contributes to Saudi economy especially the ruling class. Hajj will be there long after oil is gone. So why not invest for future and develop the infrastructure for future returns. BAGHDAD, Sept.1 -- Rumors of a suicide bomber sowed panic among thousands of Shiite Muslim pilgrims Wednesday on a bridge over the Tigris River in Baghdad, triggering a stampede in which many jumped into the turbid river or fell to their deaths on sidewalks and a children's playground below. The Iraqi Health Ministry on Thursday put the death toll at 843. The Interior Ministry said 953 people were killed and 815 injured, the Associated Press reported. Bodies of victims had been taken to many hospitals, mosques and private homes, making an accurate count difficult. The death toll from the stampede at a Hindu temple in western India today has risen to at least 168, an official said. More than 25,000 people had gathered at the Chamunda Devi temple in Jodhpur, in the western Indian state of Rajasthan. It is believed many victims of the disaster, which happened in the hilltop Mehrangarh Fort complex, were women. Television pictures showed bloodied bodies being carried to ambulances and a number of others laid out on the temple floor. Naresh Pal Gangwar, the Jodhpur district collector, said at least 168 people were killed in the stampede. The death toll from Thursday's stampede during a Hajj ritual outside of Mecca has risen to 769, Saudi Arabia's health minister has said. At a press conference on Saturday, Khalid al-Falih also said the number of people injured during the crush in the tent city of Mina while on their way to perform a ritual on the first day of Eid had risen to 934. If I take a gander, Haq is your friend khan a business man? People with religious mind commit sin all year and at the end they go to haj for forgiveness. In India in Mathura every ever approx 30 million people comes in 2 days to perform some ritual. And no stampade . All disciplined and no issue at all. FSK: "Hajj is not even close to being the largest gathering of people for an event. See the following link:"
These are not comparable to Hajj; none require the presence and movement of ALL of the attendees in one place and one time like the Ramy al-Jamarat where all 2 million plus pilgrims wants to cram in in a period of just a couple of hours between noon and mid-afternoon. For years, Saudi Arabia has had a hallowed status here, considered above question or criticism. Yet the hajj stampede near Mecca last month has taken some of the luster off the exalted image of the kingdom. Scores of Pakistani pilgrims were killed in the disaster, and many families still do not know what happened to relatives. That has set off an unusual public outcry that prompted the Pakistani government to warn the privately run, characteristically rambunctious television networks to avoid criticizing the Saudis in news programs and talk shows. Pakistan has long been a close ally of Saudi Arabia, which has provided generous amounts of military and other aid over the years. Prime Minister Nawaz Sharif has his own close ties: After his previous government was overthrown in a military coup in 1999, he went into exile there. Still, Mr. Sharif disappointed his former hosts in April when Pakistan’s Parliament voted not to send troops, aircraft and warships to Yemen, as the Saudis had asked. Immediately after the stampede Sept. 24, Pakistani officials tried to play down its scale, initially claiming that only 10 Pakistanis had died while acknowledging that at least 300 were missing. Since then, senior officials have been careful in their statements regarding the stampede. On Monday, officials said the Pakistani death toll had risen to 76 while the whereabouts of at least 60 other Pakistanis remained unknown. The Saudi Health Ministry has put the official overall toll at 769 dead and 934 injured, despite statements from more than 20 countries that, added up, brings the number of dead to more than 900. The directive to suppress local news networks has been met with strong criticism in the Pakistani news media. “The Pakistani government, which should be hounding the Saudis, is instead covering their tracks and in the process is showing incalculable apathy for the Pakistani pilgrims,” read an editorial of The Nation, a conservative English-language newspaper in Lahore. On Tuesday, the Pakistani Ministry of Religious Affairs asked a court in Lahore to reprimand a citizen who had filed a petition accusing the government of hiding the facts regarding the stampede, local news media reported. The petitioner, Arif Idrees, said that foreign news outlets had reported a far higher number of Pakistani casualties than what had been acknowledged by the officials here. Saudi Arabia could burn through its financial assets within five years, as the country grapples with slumping oil prices. The Middle East’s biggest economy is expected to run budget deficits of 21.6 percent in 2015 and 19.4 percent in 2016, according the IMF’s latest regional outlook. That means Riyadh needs to find money to meet its spending plans. Just like its oil exporting neighbours, it plans to make substantial cuts to its budgets. "For the region’s oil exporters, the fall in prices has led to large export revenue losses, amounting to a staggering $360bn this year alone," Masood Ahmed, the IMF’s Middle East director, told reporters in Dubai. There has been a trickle of evidence over the last few months that not all is well inside the kingdom. The Saudi Arabian Monetary Agency has withdrawn $70bn in funds managed by overseas financial institutions. Its foreign reserves have fallen by almost $73bn, since oil prices slumped, leaving it with $654.5bn. But with a debt-to-GDP ratio of two percent, there is plenty of room for the country to borrow money to fund its growth. Syria’s economy has contract as much as 60 percent since the start of the conflict. Yemen’s economy has slumped nearly 30 percent. Economic growth for the Middle East, North Africa, Afghanistan and Pakistan could rise to 3.9 percent in 2016 from 2.5 percent this year. Oil prices are expected to average $52 a barrel in 2015 and could rise to $63 a barrel next year. With oil prices languishing around $50 a barrel, oil exporters need to diversify their economies to absorb millions of job seekers. "Achieving fiscal sustainability over the medium term will be especially challenging given the need to create jobs for the more than 10 million people anticipated to be looking for work by 2020 in the region’s oil-exporting countries," Ahmed said. Wajahat Ali: "While Hazrat Khadija's home has been flattened for fear of idolatry, there are giant posters of King Salman and Prince Mohammad Bin Salman adorning Mecca"
That tableau is a perfect symbol of the strained marriage between the house of God — the Kaaba, in Mecca — and the House of Saud, which controls everything related to the sacred mosques. In adherence to the reactionary religious ideology it embraces, the government has allowed the prophet’s house to fall into decrepitude. It has flattened the home of his first wife, Khadija, and installed public toilets where it used to stand. But it has no objection to the construction of extravagant hotels not far away. These government’s conflicting values were on display wherever I looked: While non-Muslims are forbidden from even entering Mecca, everyone is free to eat American Hardee’s hamburgers or KFC fried chicken, or buy a Rolex watch across from the Kaaba. It’s forbidden to excessively venerate the prophet and his companions, but there’s no problem with the giant posters of King Abdulaziz, King Salman and his son, Crown Prince Muhammad bin Salman, that are all around town.